My Fender Champ was built in 1962 in Fullerton, California. There were a few different variations of this amp, but this version started in 1957 with the 5F1 circuit giving it more gain when you crank the volume, and it was the cheapest amp Fender had made at the time since 1950. The only setting is the volume control giving it a very pure tone going through one eight inch speaker. The rest of the amplifiers in the Fender catalog were going through lots of changes. 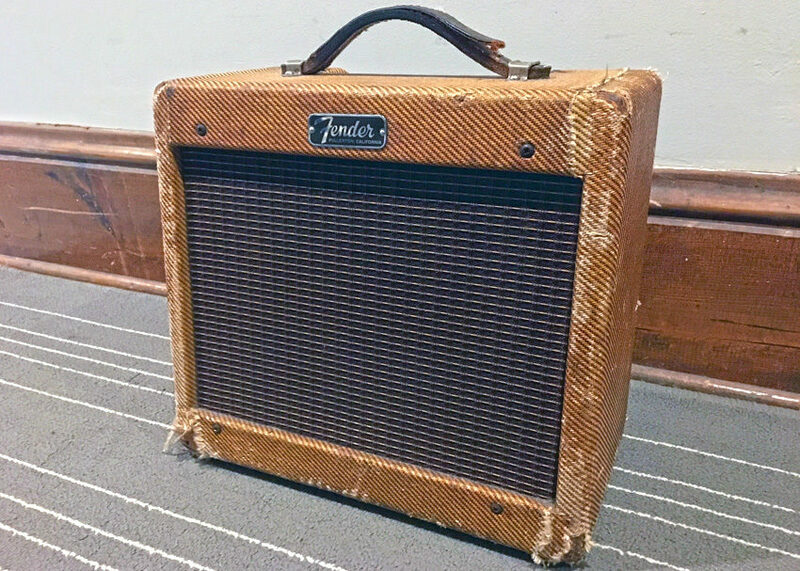 The new amps were wrapped in brown tolex, which is a lot more durable than the tweed luggage lining used on all the previous amps. The Champ remained the same from 1957 all the way to 1963 with the same lacquered tweed finish. These amplifiers were made before reverb was an on-board effect, as players wanted a pure, unadulterated tone. When I got the amp, the filter capacitors, speaker, and power cable were changed out, which is very common and necessary. The filter capacitors leak out the power of the amplifier when it is turned off, and with years of use, these will need to be changed. The original speakers had a very small magnet that would end up getting cone fry. The replacement Weber speaker was changed out to a Jupiter 8SC. It’s a beautiful recreation of the old Jensen speakers and is made to the same specification, but is more durable. When these amps were made, power outlets didn’t have a ground, so it came with a two prong cable. Replacing it with a standard three-prong cable makes it much safer to use. One of the best things about these amplifiers is how easy they are to service by any technician. They aren’t made with printed circuit board like some modern amps are made today. If resistors or capacitors need to be changed out, it’s a very easy task and with care, the amp will last a lifetime. Keep in mind that in 1962, the Fender Electric Instrument Company had just turned 12 years old and all these things were being made by hand. The manufacturing process of the entire product started by hand and ended by hand. Yes, the original tweed covering is not in great condition, but everything is there. You can see the age and the evidence that previous owners loved the amp and brought it out to play. Yes, this is a valuable piece of gear that is also a piece of American history. It was made the same year that the Fender Jaguar was first released, and when Leo Fender still owned the company, giving it collector status as a “pre-CBS” amplifier. 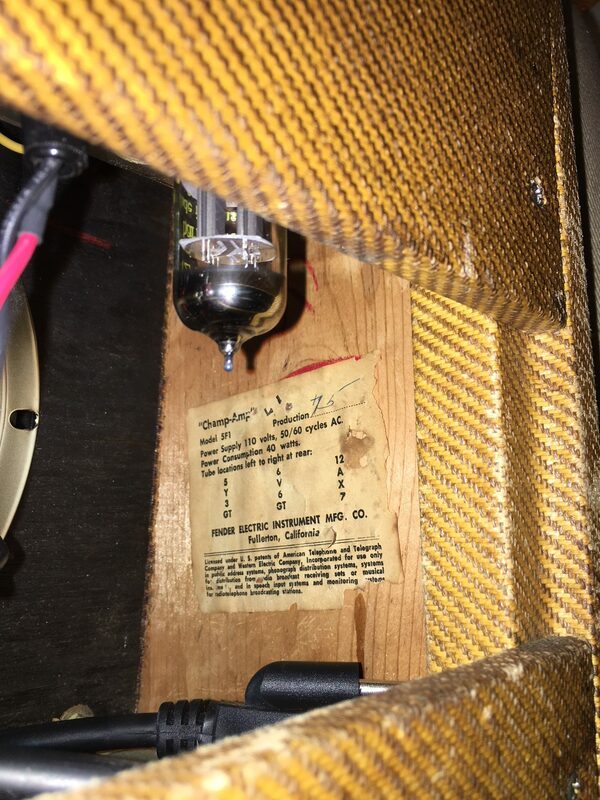 Tube chart on a 12962 Fender Champ. I wanted an amp to play at home that wasn’t going to get my neighbors too upset. Vintage amplifiers also hold their value like guitars do, and it made so much sense to jump on this when I got it. I use it every day as it was intended, and at the end of the day, I’d rather have this amp than anything else I own. As a lover of American history and everything that Leo Fender did with his original company, this is my pride and joy and I feel lucky to own it. I believe I had one of these or one close to it. It had a single “Chicken Foot” knob for volume control. My dad purchased it sometime after World War II. I remember it being in the house when I was as young as 5 and that was 1965. When he passed away in 1976 it was handed down to me and I had it until the early 90’s. I wish I still had it today it was a pretty sweet sounding little amp. Just kidding about that being mine. Mine was a ’57. I used to run out of my Marshall head and my Acoustic head into that amp (maybe that exact amp… mine is missing, you know.) to get great distortion in smaller rooms. This was back in the early to mid 70s. I blew a lot of speakers and it was much harder to find a decent small speaker back then.